Do you know the history of this Troostwood block? 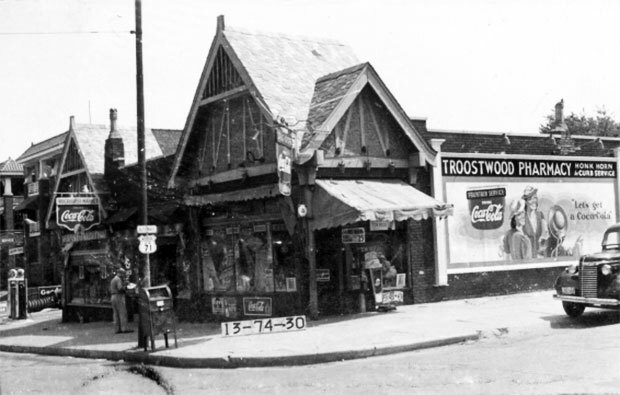 The Troostwood Pharmacy served the surrounding apartments and residences in the 1940s. 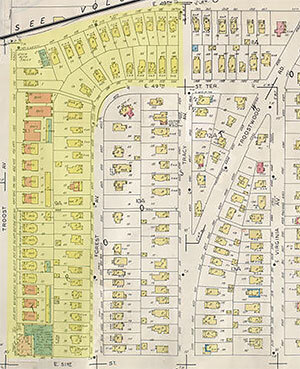 A Sanborn Fire Insurance Map shows the Troostwood area as it developed after the turn of the century. Today, we look at residences and businesses in Troostwood, from 49th Street south to 49th Terrace and 51st Street, from Troost Avenue east to Forest and Tracy. The block included a row of identical apartment buildings along Troost, the Troostwood Pharmacy, and Hellman’s Hillcrest Automotive Service. But we would like your help. Do you remember this block in 1940 or in the years since? What special memories do you have of this section of Troostwood? What years was the pharmacy called Polsky’s and was that the family name of the owner(s)? The pharmacy was owned by Morris Polsky, a pharmacist, and I believe it had just two employees. It was called Troostwood as long as I can remember. It was very small compared to modern drugstores, perhaps 1,000 sq. ft. But it seemed to have whatever most people needed, including liquor, tobacco, film processing, food, soda fountain, and medicines. I went there many times as a child in the 1960’s with my father, who was a friend of Morris and his wife, Tudie. I believe it closed by the mid to late1970’s as the area became quite run-down by then. I think he then worked for a while for a store in Raytown, called Sam’s (no relation to WalMart) before he retired completely and passed away in the 1980’s.